Believe that scrubs for women can’t be fun and fashionable? Think again! Landau scrubs’ Smitten line features youthful cuts and colors for a trendy look that still keeps things professional and functional. The collection takes a lot of its design cues from the ever-popular athleisure look, and the scrubs are cool enough that they wouldn’t seem out of place at the gym. Small details such as layered pockets and color-contrast stitching add subtle fashion touches, and the scrubs come in on-trend seasonal hues such as deep plum purple. If you still like fashion-forward scrubs but prefer something a bit more grown-up than Smitten, look no further than Urbane Scrubs. Urbane has popular collections including Essentials, Ultimate, Performance and Men’s—each with their own features. Essentials are the pieces meant to build the foundation of your wardrobe. The Ultimate collection features upgraded fabric and stylish tailoring, while the Performance collection offers moisture-wicking and flexible fabric, just like your favorite activewear. Urbane scrubs for men provide the same comfortable fit and cooling technology in colors and styles that work for men of any age. 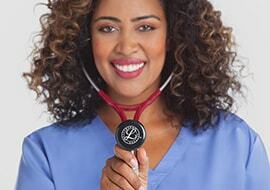 Landau’s Lynx takes basic scrubs and elevates them to the next level with VersaTec™ technology. VersaTec™ fabric is engineered to provide four-way stretch at stress points, such as the shoulders and knees, to allow flexibility and movement where and when you need it most. If your current scrubs chafe, snag or otherwise hamper your range of motion, check out the Lynx scrub line — VersaTec™ fabric could be the solution you didn’t know you needed. 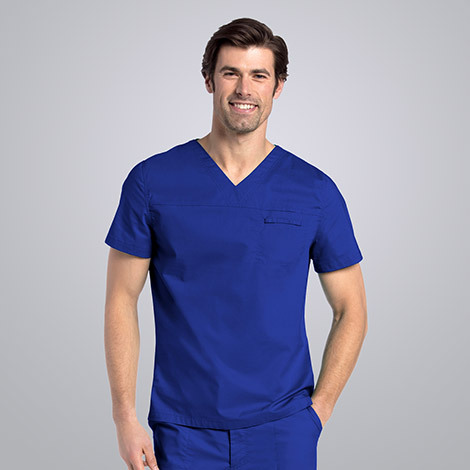 If you’re looking for scrubs with a classic design at an economical price point, Landau’s ScrubZone is an excellent choice, as its slogan shows: “Value shouldn’t just be in the price tag. It should be in every stitch.” These scrubs will see you through your work day in comfort and style without breaking the bank, and they feature the same long-lasting, high-quality construction you expect from Landau scrubs. Some of the garment options include warm-up jackets, snap front scrub tunics and uber-functional cargo pants, just to name a few. 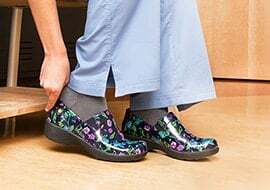 The line even features the exclusive ScrubZone Energize shoe, which was engineered specifically for medical professionals. 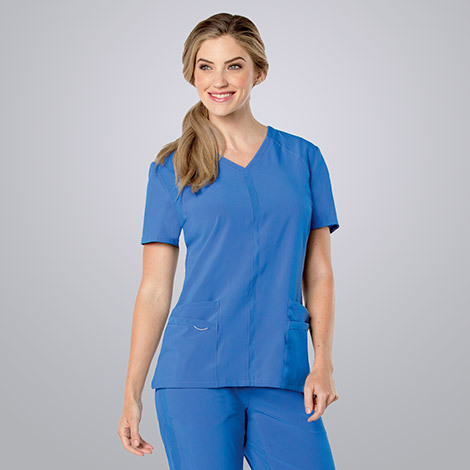 Like the ScrubZone collection, Landau’s All Day scrubs also unite comfort and affordability—but what sets them apart is the innovative new mechanical stretch fabric they’re made of. The fabric is a variation on traditional poplin, which is known for being strong and durable, yet lightweight and soft. The All Day mechanical stretch fabric was designed to weather long shifts with lots of movement without stretching out or breaking down over time, making these pieces an excellent budget-wise investment. Scrub designs are available in both unisex and women’s cuts and they come in a wide range of colors to suit every taste. 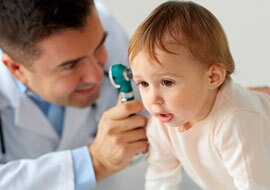 Scrubs—and lab coats, in particular—aren’t exactly known for being flexible, comfortable garments. That’s why Landau developed Smart Stretch, a line of fabrics that are designed to move with you. If you’re in need of a lab coat that looks flattering and doesn’t feel stiff, Smart Stretch offers two different lengths and a wide range of sizes–from extra-small to triple extra-large. There’s nothing quite like slipping into your old, much-loved t-shirt that has been worn soft by years of washing and drying cycles—and you can get that same feeling in your scrubs right out of the package with Landau’s Pre-Washed line. Not only will the scrubs already feel broken in from the second you put them on, they also offer improved size and shape retention. As anyone who has ever done laundry knows, the first wash of a new garment can totally alter how it fits. But since the scrubs in this collection have already been pre-washed, the risk of this happening is significantly reduced. Landau scrubs’ many lines are loved for their fashion, comfort and durability, and the brand shows no signs of letting up any time. No matter what color or style of scrub you’re looking for, you’re bound to find options among Landau’s many products.